In one case, lawyers say, Immigrations and Customs Enforcement officers left a woman alone at a bus stop with her young kids and no bus ticket. In another, ICE officers were unable to affix a mother with an ankle monitor, so they sent her back to detention without her children. The federal government said Thursday that it has reunited 57 immigrant children under the age of 5 who had been separated from their parents after crossing the U.S.-Mexico border. In doing so, the government declared its efforts to reunite "eligible children" in that age group complete, though lawyers working on behalf of the children’s families condemned the process of doing so as disorganized and chaotic. Those 57 children represent more than half of 103 "tender age" juveniles who had been identified as separated from their parents in a court case the American Civil Liberties Union filed against the government. The California judge in the case had ordered those children reunited by Tuesday — but only 38 reunifications actually occurred by the deadline, according to a report filed with the San Diego federal court Thursday evening. The government deemed the rest of the children — 45 in total — ineligible for reunification. In a Thursday court filing, though, ACLU lawyers charged that they have no way of verifying that the Trump administration actually reunited the “eligible children” at all. U.S. Department of Justice attorneys reneged on their promise to provide times and locations for the reunifications, the filing says, so lawyers and volunteers were unable to verify that they occurred and to provide the families with support. “As a result, [the children’s] individual lawyers and service providers were left frantically scrambling to find their clients and provide support,” the filing reads. In the report, the ACLU lawyers recount several anecdotes of botched reunifications. In one case, they say, Immigrations and Customs Enforcement officers left a woman alone at a bus stop with her young kids and no bus ticket. In another, ICE didn’t allow a man’s lawyer to see his client or attend the reunification. And in a third case, ICE officers were unable to affix a mother with an ankle monitor, so they sent her back to detention without her children. 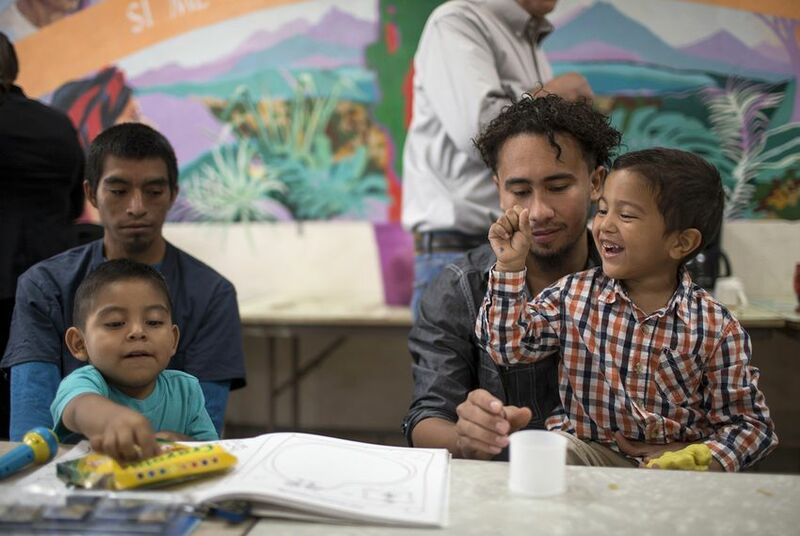 Of the kids under the age of 5 deemed ineligible for reunification, 12 have parents who were already deported by the U.S. government. Those parents "are being contacted," according to a Department of Justice news release, and those lawyers requested “a flexible schedule” for reuniting them with their kids in the court filing Thursday evening. Another 22 were found to be ineligible for reunification due to safety concerns (most often because their parents had a serious criminal record), worries about abuse or findings that the adults with whom they were supposed to be reunified weren't their parents. Eleven children's parents were also in custody for other alleged criminal offenses. And in one case, the government has lost track of a child's parent — who may be a U.S. citizen — since 2015. In a joint statement, U.S. Department of Health and Human Services Secretary Alex Azar, U.S. Department of Homeland Security Secretary Kirstjen Nielsen and U.S. Attorney General Jeff Sessions acknowledged that a "tremendous amount of hard work and obstacles" remain in the reunification process. "The Trump administration does not approach this mission lightly, and we intend to continue our good faith efforts to reunify families," they said. But the ACLU noted in a statement that the reunifications were completed two days beyond the original deadline. Most families had been divided as part of the Trump administration’s now-reversed practice of separating those who crossed the border illegally — though some had also been separated before the policy became official, and some had been separated after seeking asylum legally at official ports of entry into the United States. This week, reunified families have been released from federal custody, given ankle monitors and ordered to appear back in court for their immigration proceedings. But government lawyers signalled in court Tuesday that they might not continue that practice for long. In the future, the government has indicated, officials might give the parents a choice: Agree to be detained with their child — and give up that child's right to be released after 20 days — or release their child to the custody of the federal government. More than 2,000 children over the age of 5 remain separated from their parents, and the court has set a July 26 deadline for those children to be reunified. The ACLU lawyers outlined a number of demands in their court filing Thursday to address the “failures” of the Trump administration during the first round of reunifications. Specifically, the ACLU lawyers asked the government to supply a list of all remaining kids who have yet to rejoin their parents by July 16, as well as detailed plans for how the Trump administration plans to reunite all of them. In the same filing, the government pledged to provide those names by Friday, though they said that because of the large number of children over 5 they must reunite with parents in the next two weeks, they can’t provide much additional information. “Production of the same level of detail on a much larger scale is not operationally feasible under the current timeframes,” the government lawyers wrote. The ACLU lawyers proposed a July 19 deadline for the government to complete all parental background checks, and they requested daily reports from the government on the progress of reunifications starting July 17. The lawyers asked for 24 hours advance notice about when and where reunifications will occur — and permission to be there. They demanded detailed explanations when the government decides a child is ineligible to join his or her parent. And, they said, the Trump administration must set aside funds for mental health counseling and provide families in detention centers access to immigration lawyers. U.S. District Judge Dana Sabraw will take up these requests at a status hearing in San Diego Friday afternoon. Across the country on Thursday, attorneys in a separate case involving separated children argued before a D.C.-based federal judge about the fate of a Guatemalan woman who was separated from her 9-year-old son after crossing the border near Presidio. Jerry Wesevich, the lawyer representing the mother, told the court that immigration officials recently fast-tracked the woman for deportation after she failed to pass a “credible fear” interview, a requirement for receiving asylum. If parents are facing deportation, the San Diego ruling permits them to choose to return to their home countries with their kids or to leave the kids behind. The woman signed a form choosing the second option: to return to Guatemala while her son remained in the United States. Much of the courtroom dispute Thursday revolved around whether she really knew what she was signing. “We vigorously dispute that there’s any evidence she has given informed consent to be removed from the United States without her child,” Wesevich said to the judge. Justice Department lawyers agreed to ask Immigrations and Customs Enforcement officers to delay deporting the woman until the judge has the chance to review a statement from her on Friday. Meanwhile, ACLU lawyers in the California case proposed Thursday evening that if parents opt to have their kids deported, Sabraw require the Trump administration to do so no more than seven days after the parent gets travel documents for the child. Amid the legal and logistical imbroglio over reunifications, the three cabinet secretaries defended the Trump administration's handling of the family separations. "The American people gave this administration a mandate to end the lawlessness at the border, and President Trump is keeping his promise to do exactly that. Our message has been clear all along: Do not risk your own life or the life of your child by attempting to enter the United States illegally. Apply lawfully and wait your turn," they said in their joint statement. "The American immigration system is the most generous in the world, but we are a nation of laws and we intend to continue enforcing those laws," they said.